A group of homeschoolers and their parents working with the Wetland Restoration Team planting in Phase 4 of the restoration. Marissa discussing the features of hydric soils with the Gulf Coast Master Naturalist interns. Long-time Wetland Team member, Diane Humes, guides and teaches YES Prep students about how to plant wetland plants. A snapshot of our current Wetland Team members (December 2014) looking bright and sharp. Wetland Team member and Master Naturalist, Tom Betros, prepares plants for his students. Wetland Team members, Ray Rottman and Lana Berkowitz, working together to stage sprigged and counted Phystostegia plants--a critical function of the Wetland Team. The Wetland Restoration Program at Texas Coastal Watershed Program spans both on-the-ground restoration of public lands and the education of students and adults about the importance and values of wetlands. The Wetland Restoration Program recognizes that value of wetland restoration for storing rainwater runoff, mitigation of flooding, and improving water quality. Where wetlands in a community are absent, so to is the connection between people and nature. Restoring wetlands where we live, versus just preserving them where they still exist, improves not only the water quality, but also this natural connection. Since 2000, the Wetland Restoration Program has worked within the Houston-Galveston region to restore acres of wetlands in the local community, returning to our community greater access to nature. 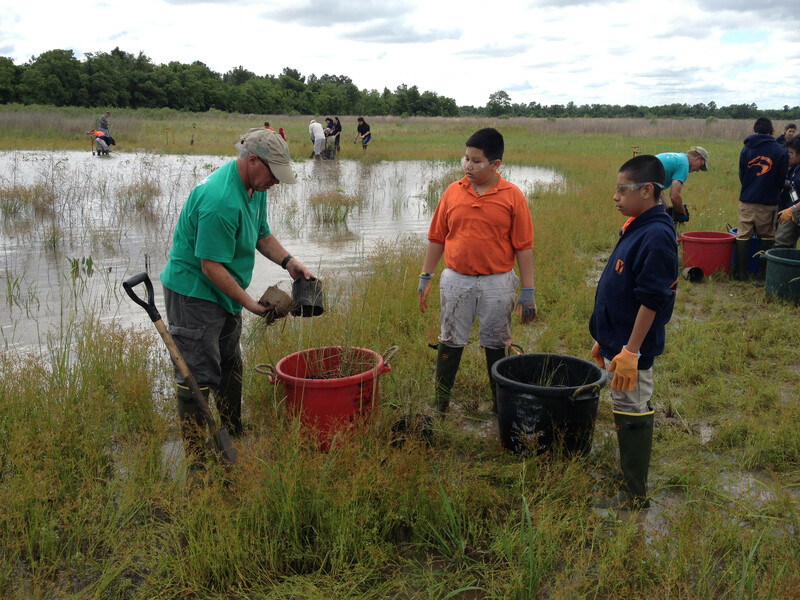 The Wetland Restoration Program provides hands-on education to students and adults through volunteer experience. Additionally, the Wetland Restoration Program hosts classes and presentations on wetland functions and native wetland plant species both on-site of restoration projects and in the local community. An education on the value of wetlands, that is reinforced with active participation in restoration, creates a tangible connection between community and nature. Participants experience how the health of their community and nature are bound together. This understanding fosters an on-going interest in watershed health.